Home Sanctuary: Just for Fun! Posts categorized "Just for Fun!" Meet Me in Person, Or Just See Me On TV! No, Really. Life is about to get a whole lot of crazy, what with Thanksgiving, Christmas, Black Friday, Parties, Shopping and Decorating. Whew! I want to invite you to two events on the same day! You can even stay in your jammies for one of them, so it doesn't get much better than that! On Tuesday, November 24, I will be a guest on the Marcus and Joni show on Daystar! I hope you'll tune in to see me talk about how interruptions (mine had long ears and a loud bray) might be the very things God uses to get our attention. Knowing you're watching will help me STAY CALM, because I'll imagine y'all in your bathrobes, holding coffee cups, cheering for me. I hope to postpone my hyperventilating until AFTER the show. Later that same day, we'll have a chance to meet each other IN PERSON at a book signing at the Barnes & Noble at Firewheel in Garland. This event is at 6:30 pm, so come on in and get your book signed and take a selfie with with me!! Let's have a latte from the Starbucks together. Hey, do you notice the new book cover on that graphic above? It has the Publishers Weekly Review on the front! Our little Flashy has moseyed his way into a THIRD PRINTING...which means that people are buying the book and recommending it to their friends. I can't tell you how thrilled I am about that. Whaaat? 6:30 pm at the Firewheel Barnes & Noble store. PS I'm very excited for the upcoming Christmas season, because I think Flash is going to make a great gift for people to give. If you are looking for a book that is heartwarming and funny–with a thread of faith running through it–then this is the book for you, if I do say so myself. It's not just for the "animal lovers," but for anyone who is likes a true story that makes ya feel good. I can't tell you how many people have told me "I bought five to give away!" That's pretty cool. And this is a chance to get your copies signed....bring your own, or purchase in-store. My newest obsession is cold brew coffee. In a word: YUM. Perfect for summer afternoons when you need a little pick-me-up, this recipe will make you happy because it's simple, makes plenty, and tastes divine. Because it is literally brewed cold, (as opposed to brewing hot, then pouring over ice) it has a mellow flavor and a greatly reduced acidity factor. Not many things fall into the "This Changed My Life" category for me, but this cold brew coffee would qualify - it's that good. Measure 3 parts water to 1 part coffee. I happened to have Starbucks on hand, but any dark roast coffee will work. I use 1 1/3 cup coffee for 4 cups of water. This tests my math skills, for which I need more coffee. See how this works? 2. Stir well, and let brew on counter overnight, or up to 12 hours. Make sure those grounds are all mixed in! That's goodness, right there. 3. Pour your brew through cheesecloth or coffee filters to remove coffee grounds. I use a coffee filter in a small colander over a bowl. Note: It drips through verry slowly, and it's difficult to be patient at this point. 4. Pour your strained concentrate into a pitcher or jar. 5. Dilute the concentrate with equal parts water. I add about 4 cups of water to my 4 cups of concentrate. 4+4 adds up to 8 cups of deliciousness...plenty for several afternoons worth of enjoyment. Feel free to adjust the ratio according to taste. 6. Serve over lots of ice, leaving plenty of room at the top for Half and Half and sugar. Or sweetened cream. I like lots of cream and sugar. YUM. Pioneer Woman (who makes a huge vat at a time) highly recommends sweetened condensed milk and I can only imagine how heavenly THAT must be. PS I tried PW's recipe too, but again...my math skills. Reducing a gigantic quantity to a manageable scale was too much for me. Have you tried cold brew coffee yet? I promise you it will change your life, or at the minimum, your outlook on it. It's possibly the best thing I've accomplished this year. Hockey Hair, Salad, and Warriors? I did not know, when I met a cute boy from Minnesota and rushed into marriage with him, that he'd grown up on hockey skates. I mean, when you only date for six months, there's a chance you'll never get around to some of the more serious issues of life before you tie the knot. Premarital counseling would have been beneficial, but of course, we didn't have time for that. All was quiet on the hockey front in our home, until the North Stars became the Dallas Stars and built a rink in our area so that people in Texas could fall in love with the coolest game on ice. Lucky for us, we had a six year old boy, and by this time my Minnesotan husband was itching to coach our cub in the ways of stick-handling and goal-scoring. And thus began my fifteen year run as a rink-side Hockey Mom. From mini-mites to the high school and collegiate levels, it's been a lot of fun. And at every single game, I've thought about all the kids in this world with physical challenges, who would love to have one minute on the ice without pain, or without a wheelchair, or without their disability. I've thought about all the moms who would love to have one minute of standing rink-side, with toes frozen, to pound on the glass for their kid. Cheering at the top of your lungs as your kid plays sports is a luxury, not a given. Which brings me to hockey hair, salad, and warriors. At our house, one of the highlights of recent years has been keeping up with the State of Hockey (Minnesota) High School Championships, and the hilarious "All Hockey Hair" videos. I'm not sure who narrates these, but a guy nominates the top "salads," or hairstyles of the kids on the ice. I love his dry sense of humor and use of all the hockey hair lingo. No doubt he'd say my son has some pretty serious "flow." This year the hockey gear company, Warrior, is sponsoring the All Hockey Hair team by donating $15,000 to the Hendrickson Foundation, which benefits Special Hockey, Sled Hockey, and the military through USA Warriors. USA Warriors is an amazing group that helps disabled vets compete on sleds, and works with special needs kids so that they can play, too. Watching these veterans zoom around on the ice and experience the thrill of competing is just wonderful, especially knowing that they've made such incredible physical sacrifices to serve our country. You can support this donation by simply watching the video. There's no catch...just have some fun. Here is this year's team, celebrating the best in high school hockey hair...and helping some terrific warriors along the way. If you're interested in helping USA Warriors more, you can donate here. Tell me, do your kids play sports? What's your favorite memory from the years of going to practices and games? Today's post is a reprise from Christmas 2007....because I still talk to my ornaments. And oddly, THEY still talk to me. I put the boxes of leftover ornaments away and I'm feeling a little guilty. You know, they're the ones that didn't make the cut to hang on this year's tree. Outshined by newer, flashier baubles, these guys have been boxed and re-boxed for up to 10 years, hoping for their chance to hang out once again with the more popular crowd of angels, bells and gingerbread men. It must be disappointing to get passed over because you're the wrong color (race discrimination) or too old (age discrimination) or the wrong size (weight discrimination). Even now I can hear them plotting to get together and file a class-action suit citing wrongful treatment of Christmas decor. I didn't even give them a chance. I just wrote them off. But really, the mauve and blue quilted kitty that looked so cute in 1985 doesn't belong here anymore. The Victorian lace heirloom ball just looks a little frumpy these days. Worse, the wooden cutout of Santa just smacks of "Craft Fair." The felt reindeer with no eyes and one antler is just too shabby, even for my standards. Somehow my tastes have changed over the years, but like the outdated clothes in my closet, I just keep hanging on to those silly things. Maybe someday they will fit again! Maybe someday I will look at that mauve and blue kitty and fall in love all over, just like I certainly will with my stirrup pants and shoulder padded shirts. Someday they will be back in style and won't I be glad I saved them from the give-away box! Truthfully, though I might sound like Martha Stewart, my little tree is not much more than a hodgepodge of hopelessly unfashionable ornaments. Which makes it all the more painful, I guess, to be excluded from a group of misfits. I've had that happen to my own self, so I know how it feels to get left out. But that's small consolation to a group of rejected holiday decorations, all dressed up with no place to go. Guys. I'm SORRY! I'm leaving you in the box and you can try out again next year. Until then, you can relax and enjoy laying down in comfort instead of hanging by a hook for weeks on end, possibly at the very back of the tree where no one can see you anyway. I'm doing you a favor, trust me. And yes, I'm turning off the closet light. I'll see you on January 2, when I return this year's chosen "A-List" Tree Groupies to the boxes and you can find out for yourselves just how hard it was to hang out with the presents. Talk about a group of show-stealers! Just be glad you aren't the poor lone ornament that never makes it off the tree at the end of the season, who accompanies the tree to the curb and never gets seen again. See, THERE's a fate none of you would want, and I'm saving you from that possibility. You'll be just fine in there, I promise. And please. Stop talking to me. I said stop talking to me. Stop. I'm humming and can't hear you. Do you have ornaments that you keep around, unable to let them go for fear of hurting their feelings? What is your shabbiest ornament that hangs around year after year...the one that gets designated to the back of the tree? Which is your favorite ornament? What memories does it inspire? The Ambush Cook, Kristina Kuzmic! Happy Monday morning, ladies! I want to introduce a fellow Company Girl who is about to have her own show on Oprah Winfrey's network . . . meet Kristina Kuzmic. Kristina's getting her OWN SHOW!! How cool is that??? Here's Kristina goofing off on her set. So cute. I first "met" Kristina some time back, here at Home Sanctuary through our weekly Company Girl Coffee link ups... and I remember thinking "this girl's got something special." Her cooking blog was fun and entertaining, and her personality sparkled through her videos. I literally laughed out loud through them. So I was not surprised when I learned that she was competing to host her own show on OWN. I just KNEW she'd get it! And she did. Yeah, I called it. psh. Kristina Kuzmic has been passionate about cooking her entire life. In The Ambush Cook, a half-hour reality cooking series, Kristina ambushes people from their everyday lives and takes them to her kitchen for an intervention in home cooking. From married moms addicted to frozen foods and take-out, to single bachelors who still go to mom's house for dinner every single night, as varied as Kristina's guests may be they all have one thing in common: they fear the kitchen! Kristina takes a no-nonsense approach to tackling the many issues that cause people to give up on cooking. From Braised Short Ribs to Pistachio Crusted Tilapia, her recipes are tasty enough to satisfy the most discerning palate, yet simple enough for anyone to follow. Failure is not an option in Kristina's kitchen. She is filling the world with better cooks, one ambush at a time! The Ambush Cook will premiere with back-to-back episodes Saturday, December 3 from 12:00 - 1:00 p.m. ET/PT. I love the premise for this show, and if they ever run short of people who need cooking intervention, I humbly offer myself as a willing ambushee for the cause. I really need a new way to cook chicken for the fam, and Kristina promises that the show will help not only cooking 'fraidy cats, but people who might be stuck in a cooking rut, like me. Now, Kristina and I have been emailing back and forth this past week, and she's got a couple of recipes to share with Home Sanctuary readers. I'll post one today and one on Friday as a reminder to tune in on Saturday. Sweet! You'll find it in the next post, below. Let's give our "own" Company Girl Kristina a big boost today by showing her some love. Follow her on twitter and like her on Facebook to help spread the word about The Ambush Cook, and then be sure and tune in on Saturday, Dec. 3rd for the premiere! You can leave her a comment here or on the OWN trailer site. Good Luck, Kristina! Best wishes from the Company Girls!! Warning: Reading and viewing this post may cause loss of appetite, involuntary shudders, gagging and general heebie-jeebies. Any adverse reaction could be harmful to your mental health and should be monitored by people who know better than to post dreadful items. Guess what I found in one of our garbage cans yesterday? Besides the disgusting water sitting in the bottom from all the rain. Something small and furry. Something that is "almost" cute as a baby and then grows up to be a hideous creature with yellow teeth and a rat-like tail. Pretending to be dead is not a myth. This possum probably dropped down into the can from a tree, and then couldn't get out. I saw him all hunched in the corner and gently said, "awwww, hey there little guy!" Then he turned his hideous face toward me and showed his horrid teeth and beady blue eyes, and I froze in terror before running for my life. Oh, the sickness! The revulsion! I returned later with my strapping teenage son, who then proceeded to scare the living daylights out of me by hitting the can and saying "WATCH OUT" just as I peered in. Girls, I screamed so loud and ran so fast I was like a bat out of you-know-where! I came to my senses on my hands and knees in the grass, yelling "I will kill you for this!" to that kid, who was doubled over in laughter. "Mom! I've never heard you scream like that before!" he managed to say. "It's DISTURBING!" Yeah, disturbing, alright. I'm disturbed that he thinks that was funny! If you've ever seen one of these things up close, you know you will be haunted by their evil visage forever. My scream was primal, honey. I don't even know where it came from. Well, I am sorry for making you look into a disgusting trash can with a gross possum in it just before having a lovely coffee time with your nicer, classier friends. Perhaps they will entertain you with sweet stories of fine china and genteel dining, or Sunday strolls in beautiful parks. Link up for a virtual cup of coffee with friends! Add a link to your blog (preferably a specific post)...the subject is up to you! Then try and visit as many blogs as you can and get to know some awesome Company Girls! Easy and fun. The newly constructed house was a beehive of activity. Every work crew was there, from the plumbers and painters to the landscapers and electricians. Everyone was trying to finish the house on time, and I was in the middle of it. The mural I was working on was taking longer than I had anticipated so I was painting as fast as I could to beat the clock. I kept thinking I would take a break, but it was a 20 minute drive to town and I didn't want to take the time, so I kept going. Oh. Important side note: I should tell you that there was no electricity in the house. Or running water. That meant that there were no functioning potties. In fact, the toilets had not even been installed. Not a problem at 9 am. BIG PROBLEM AT 4:30 p.m.
Late that afternoon I suddenly realized that the uncomfortably full feeling in my bladder was now excruciating and I was about to experience a disastrous accident. I looked around. There were people EVERYWHERE. A bush was out of the question. The port-a-potty was tipped over, plus I don't care how bad I had to go, I would never use one at a construction site, EVER. A bumpy drive to town? I would never make it. Finally, I found a closet. It was pitch dark in there. Perfect. Only there were no handles on the doors yet, just round holes where they would go. Great, just great. I couldn't even lock the doors, and there were two. I'd have to take my chances that no one would come through the one at the other end of the closet. I had no choice. I shut the door. I fumbled with the zipper. I set the cup down and squatted, holding it upright with one hand while reaching up to hold the door closed with the other hand over the door knob hole, balancing precariously over the cup, my knees about to give out...all in the pitch black darkness. Dear God, please don't let anyone come barreling through that other door! 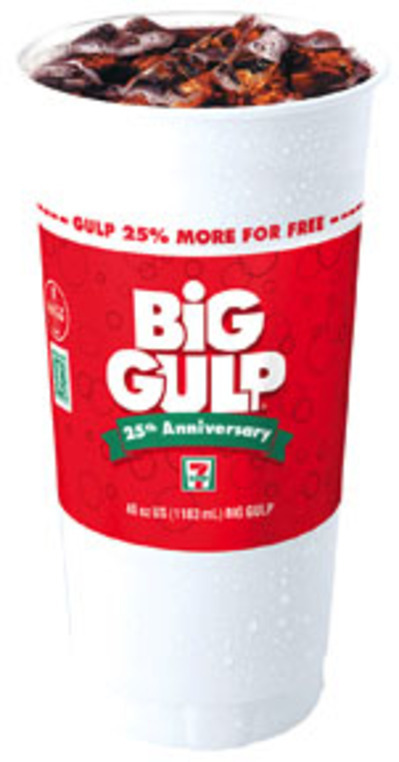 Honey, I filled that Big Gulp cup right up to the brim. The relief was euphoric! Yes! YESSSS! Now I have a very full Big Gulp cup on my hands. What am I going to do with it? I gathered myself and tried to look nonchalant as I left the dark closet with that full cup. There was literally NO PLACE to pour it out without being seen. I cannot believe I am walking around with a huge cup of warm pee. I decided I would drive it to a nearby empty lot. I carried it to the truck and set it in the cup-holder. Lord have mercy, I'm driving with urine in my cup-holder! Finally! He stops yakking and I smile a polite "good-bye" and drive slowly away so I won't jostle the liquid. Seriously, the cup was that full. Well, I learned MY lesson! A 40ish woman who's had 3 kids and no bladder control has no business ignoring nature's call or there will be consequences. And always, ALWAYS have a Big Gulp cup on hand, just in case of emergency. Today's Small Thing is in the next post. Wow! Home Sanctuary has been listed as one of the "Top 100 Christian Women's Blogs 2008" by Internet Cafe Devotions! I'd like to thank whoever nominated my blog for this honor, because this certainly is a sweet surprise! The list is long and lovely, and I am both humbled and excited to see my goofy blog named among them. I'm listed in the category of "Beautiful Cup Blog," and I noticed several familiar Company Girls in various categories: Marsha's Musings, The Heart of a Pastor's Wife, and OrgJunkie to name three. Go check out the list! THANK YOU, THANK YOU, kind company Girls! You make this blog so. much. fun. every day! And I am so passionate about the Small Things (and you girls) that I wish every woman in the world could have a chance to see what just a little bit of encouragement, effort and fun can do! It's making such a difference in my own heart and home, and I am grateful to you for the opportunity to share a corner of the blogosphere with you. Yesterday's Small Thing was to capture a moment of real life. Well, my real moment got captured alright, but not how I had hoped it would be. My husband dropped me off at a car rental office to pick up a car for the next couple of days. Normally, he would wait to make sure I got it before driving off, but he had several errands to run and I assured him that I had it under control. I stepped to the counter and went through the usual procedure. "OK, just need to see your license and credit card," the man at the counter said. I whipped them out and checked my watch. I was to pick my son up at school in 15 minutes and had just enough time to get there, drop him off at home, run another errand and then leave for a hockey game. This was going well. "Uh, ma'am, your license has expired and is no longer valid," Mr. Avis Guy said and pushed it back toward me. "I can't rent the car to you without a valid license." Oh, you gotta be kidding me. But no, it had expired last month and I've been driving illegally for several weeks. By this time, Tom was long gone, and there was no way to call him to have him return with HIS license, because he lost his phone a week ago. "There's a DPS office in the next block," the guy said helpfully. "You could go renew it and come back." I immediately envisioned the DPS office, a dimly lit room with orange plastic chairs and a hundred people waiting for their number to be called. I've been there before and remember it well. I was stuck. I could see no other choice but to do as he suggested. So I walked through the drizzle to the DPS office, hoping it wouldn't take forever. Have I ever mentioned what drizzle does to my hair? Well, it gets frizzy AND flat at the same time. Did I also mention that I was wearing a stained sweatshirt? I'm quite sure I was not wearing lipstick. And I knew, as I hurried along through the wind and dripping rain, that I would be stepping behind a line and looking into a camera, operated by someone who could care less about capturing the essence of who I am. I got up to the DPS counter with no wait time. I guessed on only a few of the numbers in the vision screening and fudged just a teeny tiny bit on my weight. I'm certain that those few pounds will be gone right after I start my exercise program, so really, I was just speaking in faith. But before I could do a happy dance at my speedy progress, things came to a halt when the lady refused to take my debit card. "Checks or cash only, Hon," she drawled. "You could go around the corner to the grocery store and buy yerself a soda, get cash back and come on back here." She was also quite helpful. So I trudged through the drizzle as she suggested, and returned with the appropriate cash. I was madly texting my son to tell him to take the bus. And despite her machine breaking down in the middle of the whole thing, I managed to step behind the line and smile like a drowned rat for the photo I'll be carrying around for the next six years. I can hardly wait to see my moment of real life captured on my license when it comes in the mail.